15ft tank is next, say 25ft gun protesters! Stop the War: Five Years on. September 30 Target Practice for Compostables. Hundreds of people gathered on Sunday for a day of talks, information, discussion and workshops on the theme of peace. The Nottingham Students Peace Movement's conference welcomed Sam Azad (International Federation of Iranian Refugees), author Milan Rai and Alan Simpson MP to lead a discussion on "justice not vengeance." They were followed by lecturers Richard Keeble and Beryl Aldridge and Notts Indymedia's Wietse talking about combating media bias. Both sessions welcomed extensive audience contributions. 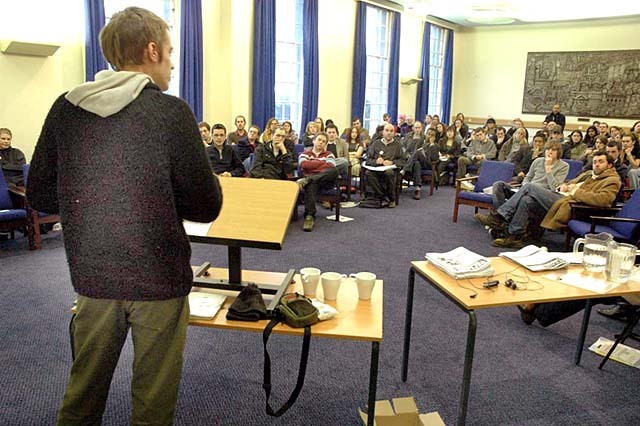 Various workshops were later held on alternative media, creative campaigning, civil rights and black activism.